Reason #1: Stress-Free Appointment Times. Imagine this – my business drops to an all time slow pace in February – you can call me and have your pick of the schedule. Heck I might even be able to get you in that day or the next. Reason #2: People tend to take their shoes off this time of year. Translation? Your carpets stay cleaner longer. Reason #3: Transform your carpets from dull to dazzling. Okay, okay I admit I can do that any time of the year but it’s always a great reason to call. Besides aren’t some of those holiday spots and spills starting to bug you? And if you are worried about cold air getting in/hot air escaping during your cleaning. Forget about it. I go to great lengths to minimize your home’s heat loss during winter cleanings. 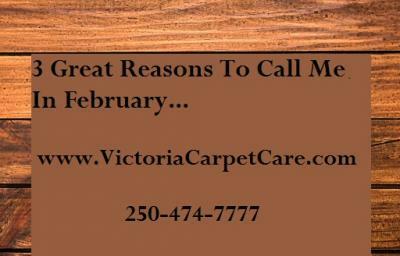 Victoria Carpet Care is happy to provide our Carpet, Upholstery and Area Rug Cleaning Services to all of Greater Victoria, Sooke, Metchosin, Langford, Colwood, Saanich, View Royal, Esquimalt, Cordova Bay, Fairfield and Oak Bay. Request a FREE Carpet Cleaning Evaluation today!